Wednesday 5 April, marked the annual Junior Primary School Soccer competition at the CIFA Complex in Matavera for students in Year 4, 5 & 6. An exciting and big footballing event in the local schools’ calendar and every year those who are present at the games are all treated to a fun filled day of football. Nine Primary Schools have participated in this year’s event, namely Takitumu, Avarua, St Joseph, Apii Nikao, Arorangi, Rutaki, Papaaroa College, Imanuela Akatemia and Apii Te Uki Ou. There were four divisions for schools to compete in, B Boys & B Girls of Year 6 students, B Mix for Year 5 students and C Mix for Year 4 students. In the B Boys division, seven schools participated and were drawn into two pools where they faced each opponent in their pool to determine the top two placings for a spot in the play-offs, Papaaroa, Avarua, Te Uki Ou and Nikao securing their chances. Avarua proving too strong for their opponents to claim the 2018 title with Te Uki Ou in second place and Papaaroa taking out the third spot. In the B Girls division, five schools participated and played each other once to lock in the top four placings. A play-off between the first, second, third and fourth placed school took place and the outcome so obvious for Avarua who remained unbeaten and to raise the 2018 trophy for their school and Nikao in second place with Te Uki Ou in third who had to go to penalty shoot-out with Takitumu to claim third much to the excitement from the players. With only four schools participating in the B Mix division, two-round of games had to be played and winners Papaaroa secured the 2018 title over Rutaki and Akatemia Imanuela who took out second and third place. 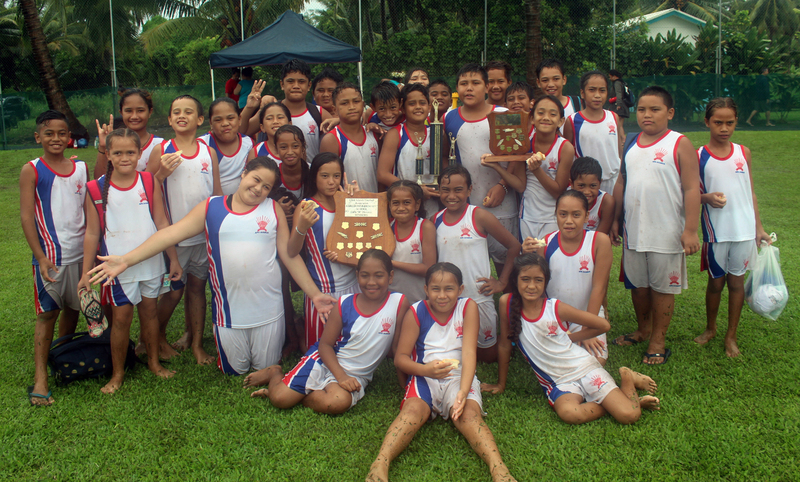 All nine Primary School participated in the C Mix division and for those who braved the wet weather will admit that it was an exhilarating division to watch and these youngsters left nothing to chance with St Joseph stamping their dominance by winning all their games to claim the 2018 title for their school. Avarua coming in second while Paparoa taking out third. For the parents, supporters and teach, it was a day full of exciting football displayed by our Primary School students. After the finals games a presentation of trophies took place and were presented by CIFA Vice President, Junior Areai, General Secretary, Mii Piri, Strength & Condition Coach, Jason Stephens and Development Officer, Tahiri Elikana. On behalf of the CIFA President, Mr. Lee Harmon, Executive Committee and staff, many thanks must go to everyone that was involved in such a successful soccer competition.